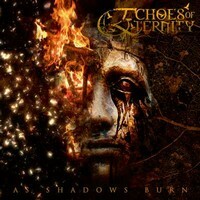 With As Shadows Burn the American quartet Echoes Of Eternity is back. Their debut was released in 2007 and could get them some attention. To label their music isn't easy, singer Francine Boucher and her mates combine fast riff-based power metal with progressiveness and female vocals. The opener Ten Of Swords is a good choice to check out the band from L.A.. After the fast opener they slow down a bit for the catchy Veiled Horizon. The foursome varies in speed and Francine Boucher offers angelic vocals, but due to her deeper timbre - mezzo soprano? - it sounds different compared to the sopranos of Liv Kristin or Sharon del Adel. Musically the songs could vary a bit more and it would be a nice surprise to hear some more powerful and more aggressive passages from Francine. Anyway, Echoes Of Eternity aren't the typical female-fronted band. The slow passage at Descent Of A Blackened Soul shows a different facet of Echoes Of Eternity and they should show this a bit more often. Okay, Twilight Fires is different with it's fast drumming, but somehow this is the problem - at least for me -, it's like a speed metal tune peppered up with angelic vocals.... Musically this one reminds me of some black metal stuff, just the vocals won't fit... With the following track they stay on the chosen path... I like Francine's vocals, but I do have a problem with their blend of sounds. Check out: Buried Beneath A Thousand Dreams, Ten Of Swords and Funeral In The Sky.